Isn't this a stunning background??? This was created by Tesa Broman. All the specifics are on her blog. She made the background with watercolor paper, sponging, and water drops. She gives directions on her blog as well. The stamps she used are the "Creepy tree and fence", "Just Batty", and "Classic Halloween" sentiment...all from The Rubber Cafe'. Gorgeous card!!! I'm sharing my own creation today. 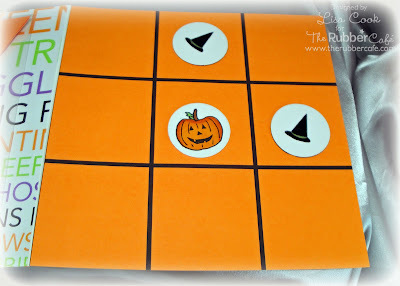 This cute game/card is made from the Trick or Treat set at The Rubber Cafe'. There are so many cute pieces to this set! It would also be wonderful to make a bingo game with! I wanted something that was easy to mail so I settled for tic-tac-toe instead. I was happy with how it turned out! The card is 6 inches square. I printed out the tic-tac-toe grid on the computer. It's just a 2" grid. I used a clear envelope attached to the left side of the card to hold all the little game pieces. They are just circle punched pieces of card stock. I covered the back of them as well. Really cute way to use such a versatile set! This gorgeous set was created by Lindsay for The Rubber Cafe'. She used the Bon Appetite set. Wouldn't you love for a dinner guest to show up with this gorgeous set? Aren't the tag shapes unique? Lindsay promises they are quick and easy. She used the "huffing" technique to color directly on her stamp and then "huff" on it before applying it to the paper. It worked beautifully for this project! 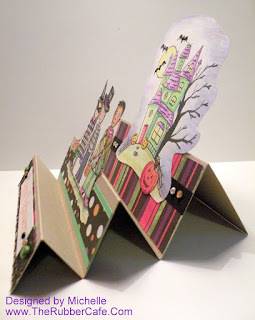 This card technique is called a "Stair step Fold" and directions can be found here. The folds are way easy to create using a Scor-Pal too! I LOVE my Scor-Pal and it's never far from my desk since I use it in almost every creation! I had fun coloring these images with my Koh-I-Nor colored pencils and my Prisma Pencils but instead of Gamsol I used the Prisma colorless blender pencil and am very happy with the way it helps smooth out the lines from coloring! These images are just so "coloring friendly" you can't resist but, that's not all the fun you can have with them! Since these are part of Melissa's newest line of clear stamps too that means you can stamp them on designer paper and cut them out to layer! If you click on the picture you can see where I did just that with the kid's costumes! The house stamp is a spoooooky one too isn't it?! It's called "Bat Motel". I'd almost be afraid to knock on the door! LOL! It's not a clear stamp but is a good ole red rubber stamp you can purchase with clingmount already on it! How's that for convenient! 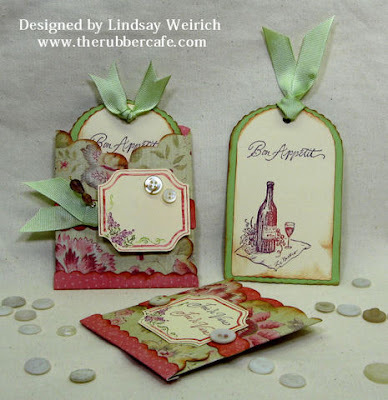 That stuff sticks to almost anything but, if you're looking for something to use with all of your clingmount stamps AND your clear stamps too,try the "Rock a Blocks" - they're awesome, and not to mention my favorite color purple to boot! Well I hope you have as much fun with your new stamps as I did with mine! I'll be making more projects with these cutie pies! Mmmm pie...gotta run for dinner now! Enjoy my card and don't forget to share your Rubber Cafe creations back here with a link! What has 8 legs, creeps around but is cute as heck?! 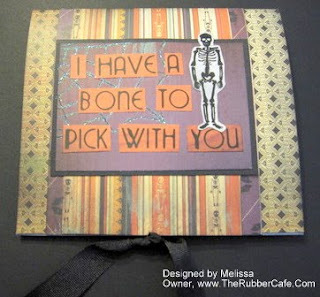 This card!! How cute is this little spider guy?! Don't you love how the spiderweb is all sparkly in the background?! 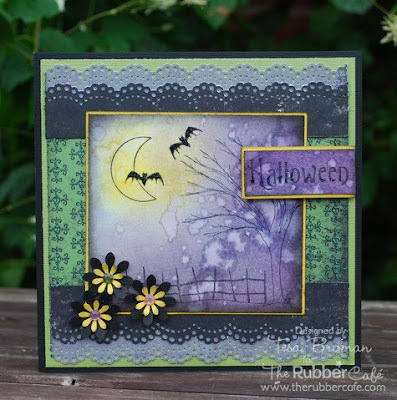 This was designed by Lisa Cook, one of our design team members who has been very busy lately creating a lot of new projects featuring The Rubber Cafe's new Halloween line of stamps! I love her color choices too, black and bright green cardstock are awesome together! Love the red rhinestone eyes too! Must be a girl spider since every girl likes a little bling! 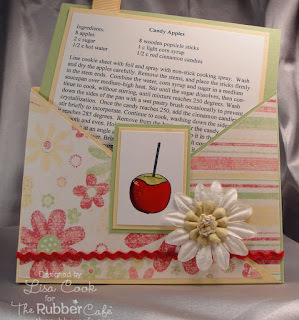 Lisa used the new stamp "You Need to Dust" and stamped it out several times to make it round. I love how she connected the spider using black fiber too! Great touch! 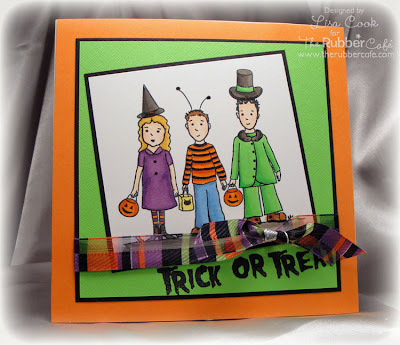 She chose to use the "Frightful Halloween" stamp for her sentiment but don't worry, if this one doesn't work for your card style there's one not quite so scary you can use too called "Classic Halloween"
Need one of these stamps?! Well get yours before they're gone and you're kicking yourself (I know this move personally!) for not getting one! So many things you can do with them all! 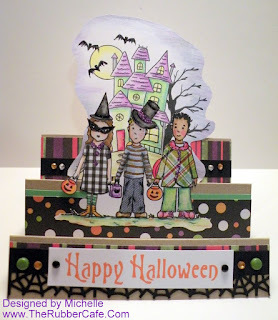 Come back soon for more fun Halloween stamp ideas!! Don't forget, if you make a creation featuring The Rubber Cafes stamps leave us a link so we can see your awesome work too! 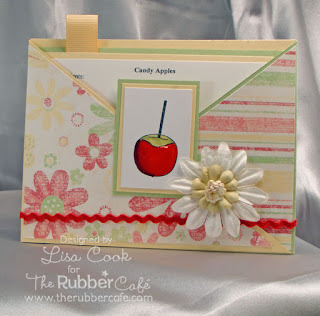 Lisa used the stamp, "Halloween Candy" from The Rubber Cafe's Halloween section to create this. Didn't she do a great job! If you look at the stamp it is a larger stamp but don't let that stop you from all the different ways you can use one of this size! 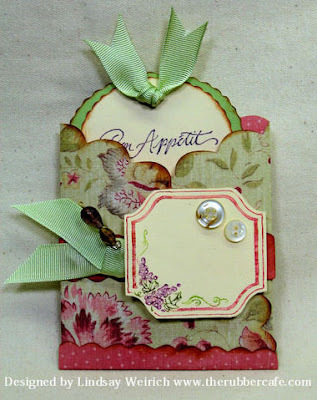 You can use it as a whole stamp in the background or cut out the portions that suit your project like you see here! This stamp lends itself to coloring with either Copic Markers or colored pencils - both are "hot" ways to color right now! I am imagining this stamp being stamped on little white bags, colored, and the bag secured with some great Halloween ribbon full of treats to give those special little goblins in your life too! Fun stuff and endless opportunities here! Not only Halloween either.....let your ideas run wild! So, where do you get this fantastic stamp?! The Rubber Cafe, that's where! Check them out to see what other fantastic stamps they have......don't miss the NEW lovey dovey turtles "Stella and Angus" - ADORABLE!!! Ghosts and goblins, princesses and pirates, ninjas ready to fight...who else needs a treat on that special night?! Who?! Your little furry friends! That's who! I just loved the sad look on this little doggies face, he wants his treat! LOL! I mean he is all dressed up after all right?! So what do you say?! Take a look below and then tell me! 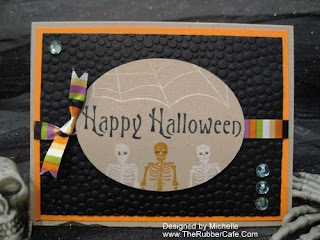 We used these super cute stamps from The Rubber Cafe's new line of Halloween stamps. 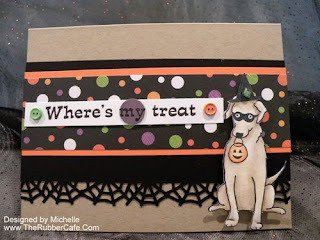 It's called "Where's My Treat" labrador, Halloween Candy, The Bat Motel, and You Need To Dust (spiderweb). These are all available on "cling mount" so you can store them easily! If this is your first time with cling mount stamps, even if it's not, and you're looking for some great blocks that are easy to grip, try the "Rock-a-Blocks"! They come in a variety of sizes so you can find one that fits close or use a bigger one and combine the stamps on a larger block for one quick stamp! 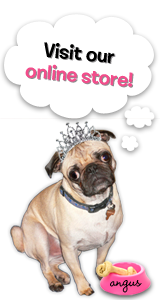 So now, don't forget your furry little friends this Halloween! They deserve a treat as well! We Got A Bone To Pick With You! The bow on the girls head is drawn by hand but I bet you're wondering where the hearts came from right?! Well, it's actually from a Lori Renn stamp! It's called "I adore you", which on it's own would have been perfect for this card but I chose to stamp it twice too, cut out the hearts and cover them in Stickles for a little bling to tie in the rhinestones in the bottom right hand corner! Who says Halloween has to be only black and orange! I think purple is an awesome color to include and really pops here! 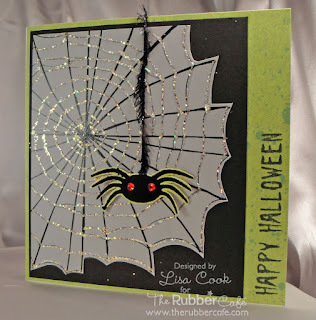 The spider web, called "You Need To Dust, is another great stamp that you can use anyway you want whether it's as a focus stamp or perhaps, as it is here, a background stamp! So we used the skeleton stamp and cobweb stamp for these. It is available on cling mount so if you were to use the clear blocks, or Rock-a-Blocks, with them you can easily line them up anywhere on your project! So what do you think?! A little different but fun! 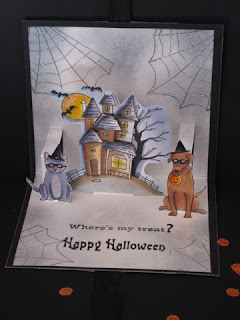 I hope you like it and don't forget to post your projects using the fun Rubber Cafe Halloween stamps and give us a link back here so we can see what you're doing too! Alter This...For Some Halloween Fun! 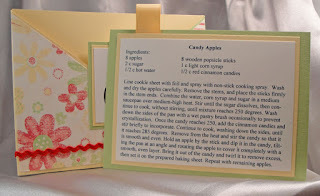 So here's the details of what I did to create this fun little treat! We had Spam and eggs...oooh I mean I cleaned my can really good. 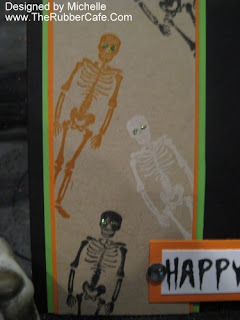 I took my favorite Halloween stamp called "You Shake My Bones", I created my own paper using black and orange ink. I measured out the lines so I could stamp them evenly, voila! My own designer paper! 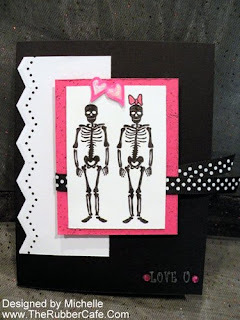 I could have stamped the skeleton any number of ways too but straight strips seemed to fit my needs for this project! 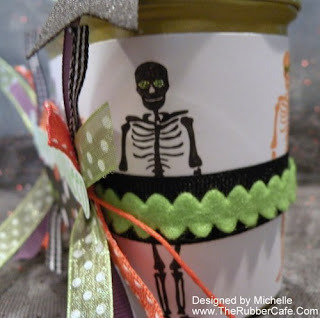 The words "Happy Halloween" are stamped out in green to coordinate with my Designer Paper. 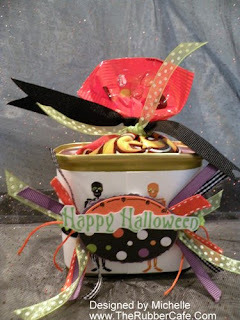 The polka dots are from K&Company and is called TC Halloween Black Dots Flat Paper. I just picked it up last week and couldn't wait to use it in as many projects as I could get it into! I also "had to do" something different to the skeletons! I gave them green glittery eyes! I loved them! It also helps tie in the green! 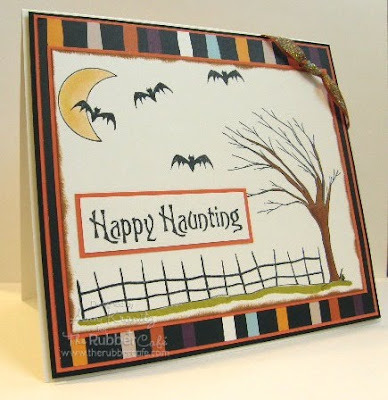 For the label with the "Happy Halloween" I simply taped my papers together, positioned my oval nestie where I wanted it and cut it out! I cut around the words and added them as well! I used random ribbon bits and pieces I have left over from other projects, can't seem to throw out much! LOL! The candy is actually Reeses Pieces which are safe until my daughter finds them and makes them "magically disappear"! LOL! 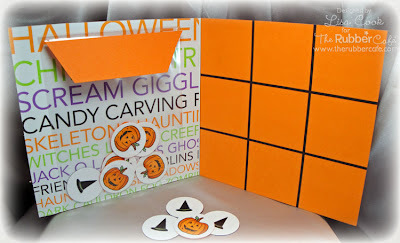 Well I hope I inspired you to not only create a fun gift for someone in your neighborhood and get the "Boo-ing" going but, to also get the great ideas of different ways you can use these great stamps! So how about a Halloween dare?! Are you game?! 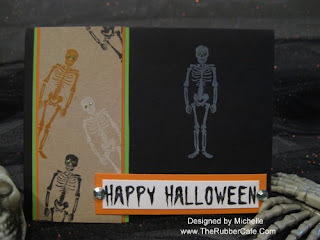 Let's see what you can come up with using your own skeleton stamp! The possibilities are endless! Just don't forget to post a link to your creation back here! !